When most fans think of UK, they think of its powerhouse baseketball team, but the football program has been a staple at the University of Kentucky since 1881. In the 1970s, after over five decades at Stoll Field, the Wildcats need a new football facility to meet SEC stadium requirements. Stoll Field could not be expanded, therefore the University of Kentucky decided to build a new football stadium, Commonwealth Stadium. On September 15, 1973 the Wildcats christened Commonwealth Stadium defeating the Virginia Tech Hokies. At a cost of $12 million, the stadium originally had a capacity of 57,800. By the late 1990s, the Wildcats decided to expand Commonwealth Stadium to meet the growing fan base. In 1999, the stadium was enclosed on both ends and 40 new suites were added increasing the capacity to 67,600. Two LED HD video/scoreboards, measuring 37 feet high by 80 feet wide, are located in both endzones. Today, the lower deck surrounds the playing field and upper decks are located on both sides of the gridiron. The luxury suites and press box are located between the seating decks. The Wildcats hope to continue to build their fan base up and create championship caliber teams like their basketball program. 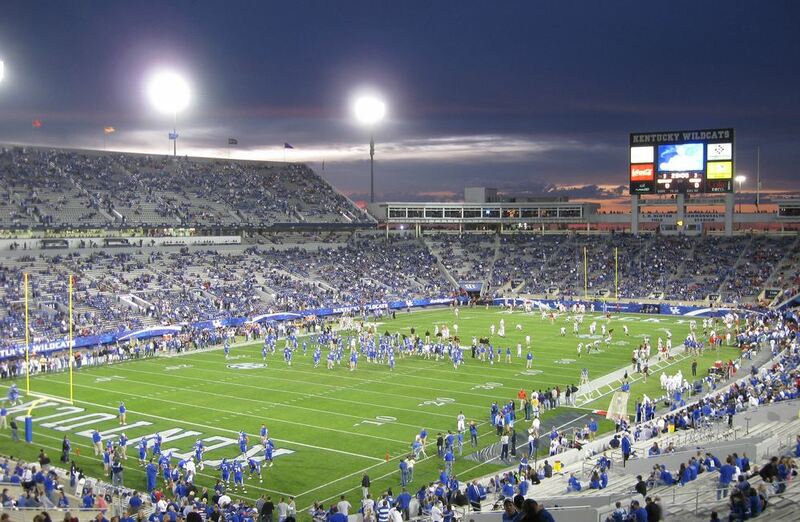 In November 2013 the University of Kentucky announced plans to renovate Commonwealth Stadium. Completed by the 2015 season, the $110 million project reduced the capacity of the stadium to 61,000 but provides a better atmosphere for fans. On the south side of Commonwealth Stadium a multi level structure was built to house a new pressbox, 28 luxury suites and 2,300 club seats. In addition, a new tunnel for the Wildcats team to run onto the field was constructed and the light towers were replaced with banks of lights atop the stadium rim. In May 2017 the university announced that the naming rights to Commonwealth Stadium were sold to grocery retailer, Kroger. The naming rights agreement makes the stadium one of the few named after a corporate sponsor. The deal pays the university $1.85 million yearly over the next 12 years. Commonwealth Stadium us now call Kroger Field.